The book says the author is India’s No.1 thriller writer. Well, he surely deserves it. He is the first Indian author to have struck the chord in me. With well maintained language proficiency, vocabulary and consistency in the story plot, Mr. Ravi Subramanian deserves all credits for this amazing novel and surprisingly so for an Indian author! I had a repulsion towards Indian authors particularly because of low English proficiency in their writing. Chetan Bhagat’s stories were the last I could admire, notwithstanding the level of language proficiency. I had no more expectations from Indian books. But this novel! This novel has pushed the limits of Indian authors to a much higher level, and do please keep up the good work, Sir! It is good to have a Sidney Sheldon from India. 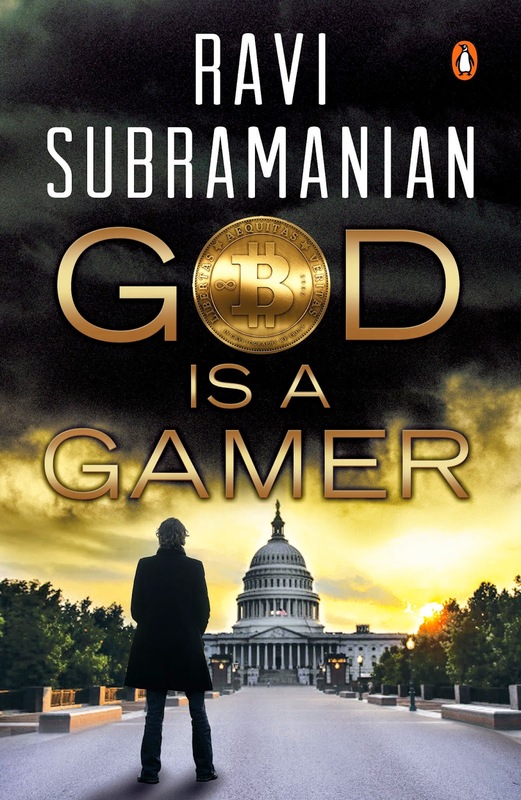 The best thing I liked about this novel was that even a layman could understand the concept of bitcoins and the story revolving around it. Such is the explanation, description and coherence of the chapters as they unfold with pages. It has a very gripping prologue and makes the reader ask for more in the coming pages. 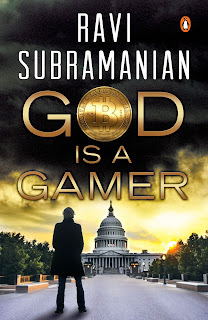 The story revolves around the main characters Adithya, Swami and Sundeep, former employees at NYIB; Malvika Sehgal, Indian CEO of NYIB; her daughter Tanya ; Varun, Tanya’s boyfriend and Adithya’s son; Gillian Tan, Senator of USA and the agents Adrian Scott, Dan and Tony; Indian finance minister in an affair with Malvika. Adithya’s past suddenly looms back one day when Varun is found jailed for an Indian-Nigerian issue of selling of drugs. Adithya acts as his son’s saviour and his life becomes hell from then onwards. He faces a series of issues and plummeting of revenues in his own companies – eTIOS and Indiscape. As he tries to get them back on track with the help of Swami, Sundeep and his son, he discovers, his company is being possessed by someone to carry out crimes in US. Malvika’s murder, Swami’s death, Gillian Tan’s murder are linked to each other as the agents Adrian, Dan and Tony try to un-entangle the mystery with the help of Indian police. Another thing that was interesting about the novel was that the story is released in bits and pieces. The starting pages talk about Senator Gillian Tan and his story and suddenly after he confronts an explosion, his story comes to a standstill and starts off with stories of other characters – Indian PM, Swami, Tanya, Varun, Adithya. This way the curiosity of the reader is maintained. The death of Malavika fit in well in the narration and brought the intended shock to the readers. Although there are many mysteries unravelled as the pages are turned, it does not keep the reader waiting for too long, which is good. The pace at which the incidents happen is very consistent. A dragging slow and boring novel would be a waste of time, otherwise. The chapters were kept short and did not drag too much. I was always suspecting Varun and Sundeep to be involved in the ATM heist, Cotton Trail and Gillian Tan’s murder. But, Tanya being targeted, came as a shock to me. I have very slight inkling on her. Anyway, Varun was the main culprit, agreed. But, he roams free in spite of being the biggest culprit. And the Agents Adrian Scott and Tony settle with their investigation with Tanya as the mastermind of the crimes. This makes me angry. When I found out that it was Tanya who was genuine in her love for Varun and that she did not cheat on him, it was relief and at the same time, disgust for Varun. Tanya’s reaction to the FBI agents was not apt, when they threw light on all the crimes taken place so far and held Tanya as solely responsible. Her reactions were not justified. She was mostly like a confused immature girl that did not go well with the situation. The novel demands memory and concentration on names of characters, terms and some facts, to be on track with the story. For a thriller to be completely successful, I would have liked it better if the agents had got the real culprit. Is revenge a crime? The novel poses an interesting question. The answers may be subjective as people differ in their thoughts, but here the revenge of Varun against his father Adithya has made a thrilling novel. Verdict: It is a complete thriller and is the best among the Indian books that I have read. I would definitely recommend it to others.